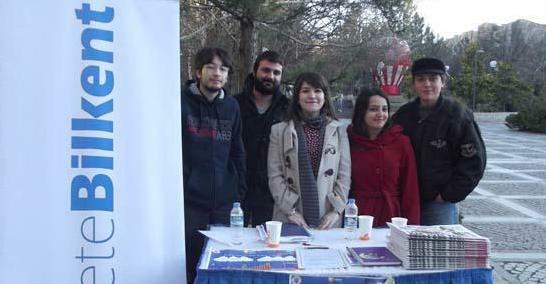 GazeteBilkent is holding an aid campaign to build a library at the Osman Ünyazıcı Elementary School in Sincan, Ankara. Donations of books, stationery items and clothing will be accepted as part of the campaign. The books will be used to create the library, and the rest of the donations will go to the Sevgi Childrens' Home. Both institutions are affiliated with the Social Services and Child Protection Agency (Sosyal Hizmet ve Çocuk Esirgeme Kurumu). The campaign was organized in collaboration with TDP (Toplumsal Duyarlılık Projeleri) as part of their "Güneş Köyden Doğuyor" project, which was established three years ago to provide an overall framework for the many campaigns that aim to restore schools in need of repair in rural areas. The campaign stand, which opened last week, will be in front of the FEASS building (A Building) until Wednesday, March 6. The renovation of the room that is to become the school's library will begin on March 16. Working with TDP, GazeteBilkent members will paint and plaster the walls and retile the floor in preparation for the 2,000 books they hope to collect for the project. The clothing and stationery items will be presented at the preschool on March 23. On the first day that the stand was open, the group collected a box of books and some toys, but they will need many more donations to realize their goal and help the children at the school and the home. So if you want to chip in, please do stop by their stand. And remember: each donation, no matter how small, is granted 50 points for GE250/251.